To help promote the fact that fibre broadband is widely available in Falkirk, the Digital Scotland Superfast Broadband team were out and about in Larbert and Polmont this week to continue their ‘Up your Street’ campaign. More than 10,500 homes and businesses across Falkirk can now upgrade to faster fibre broadband through the £428 million Digital Scotland Superfast Broadband rollout. Local people need to sign up for the new, faster services with an internet service provider, as upgrades are not automatic. Across Scotland, more than 890,000 premises are able to connect to the new network thanks to the programme. Areas across Falkirk to benefit from the Digital Scotland rollout, led by the Scottish Government, include Airth, Castlecary, Allandale, Larbert and parts of Falkirk. More local coverage will follow as engineers from Openreach – Scotland’s digital network business – continue work on the ground. Each week the programme, one of the largest broadband infrastructure projects in Europe, reaches more remote and rural areas. Across the country nearly 4,500 new fibre street cabinets are now live and more than 11,000km of cable has been laid by engineers from Openreach, Scotland’s digital network business. Fibre broadband offers fast and reliable broadband connections at speeds of up to 80Mbps1 and there are many suppliers in the marketplace to choose from. Delivered through two projects – led by Highlands and Islands Enterprise in its area and the Scottish Government in the rest of Scotland – funding partners also include the UK Government through Broadband Delivery UK (BDUK), BT Group, local authorities and the EU via the European Regional Development Fund. Thanks to additional investment as a result of innovation and new funding generated by stronger than expected take-up, the programme will deliver new DSSB deployment in every local authority area during 2018 and into 2019, complementing ongoing commercial build across Scotland. Rural Economy Secretary Fergus Ewing said: “Once again it is very positive news knowing that more premises than ever before now have fibre broadband available to them. “I would encourage more people to check whether they are eligible to upgrade on the DSSB website and contact a service provider of their choice to start receiving faster broadband. Councillor Cecil Meiklejohn, Leader of Falkirk Council, said: “High speed broadband is transforming our local communities for residents and businesses alike. Robert Thorburn, Fibre Broadband Director for Openreach in Scotland, said: “As the rollout nears its end stages, we’re really digging in to some harder-to-reach communities and places where the engineering challenges are more significant. 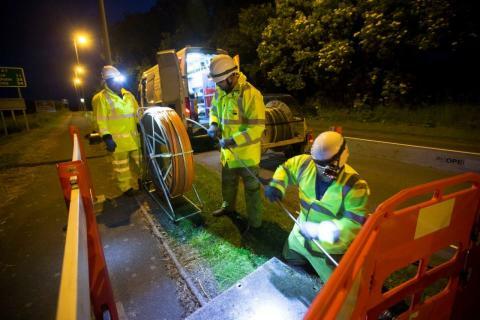 “Many of these latest lines have been converted from a format once thought incompatible with high-speed fibre broadband, and we’re increasingly using ultrafast Fibre-to-the-Premises (FTTP) to deliver the network directly into some individual dwellings. 1 These are the top wholesale speeds available over the Openreach networks to all service providers; speeds offered by service providers may vary.